West Jefferson Industrial Medicine, L.L.C. Occupational Medicine from West Jefferson Industrial Medicine. 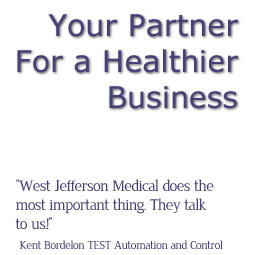 West Jefferson Industrial Medicine specializes in the healthcare of employees. This allows us to effectively manage the concerns of the business community allowing us to be more of a business partner than a vendor. Our doctors are hands-on professionals who freely share knowledge and advice, and who bring incredible value to the business relationships they have. West Jefferson Industrial Medicine is an occupational medicine provider. We are flexible, accessible, and close by, with two offices – Wall Blvd in Gretna & West Bank Expressway in Marrero, we can serve the business community more effectively and efficiently. Occupational Health aims for the promotion and maintenance of the highest degree of physical, mental and social well being of workers in all occupations; the prevention among workers of departures from health caused by their working conditions; the protection of workers in their employment from risks resulting from factors adverse to health; placing and maintenance of a worker in an occupational environment adapted to his physiological and psychological equipment. In sum, the goal of Occupational Medicine is the adaption of work to people and of each person to their job.